PANEL DISCUSSION: The Bay-Delta Water Quality Control Plan Update: Now What Happens? The State Water Board is expected this year to adopt proposed changes to the Water Quality Control Plan for the San Francisco Bay/ Sacramento-San Joaquin Delta Estuary, more commonly known as the Bay-Delta Plan. Among its considerations, the proposals would increase flow requirements to a starting point of 40 percent of unimpaired flows. If the State Water Board adopts the proposed Bay-Delta Plan update, how could it be implemented? What is the potential for voluntary settlements? A panel at the spring conference at the Association of California Water Agencies brought together David Guy (President of the Northern California Water Association), Tim O’Laughlin (attorney with O’Laughlin & Paris, LLP), Jennifer Pierre (General Manager of the State Water Contractors), and Eric Oppenheimer (Deputy Director of the State Water Resources Control Board) to discuss these issues. The panel began with a presentation from Eric Oppenheimer who gave an update on where the State Water Board is in the process of updating the plan. 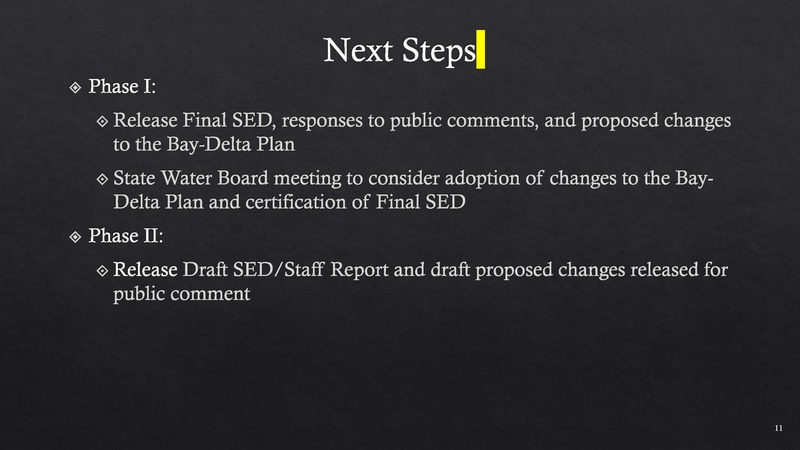 Completion of the Bay Delta Plan update is a high priority for the board and he acknowledged they have been working on it for quite some time. The Bay Delta Plan is similar to the basin plans that are adopted by the regional boards. The plans are required to have certain components, including identifying the beneficial uses of water such as irrigated agriculture, municipal and industrial uses, and fish and wildlife protection. The plan is also required to identify and set water quality objectives that are intended to protect those uses and then include a program of implementation that once implemented, would achieve the objectives and therefore protect the beneficial uses of water. “What’s different about the Bay Delta Plan is that it includes water quality objectives for flow, and as a result, it has largely been implemented through water right actions,” said Mr. Oppenheimer. The water code and the Clean Water Act provide the State Water Board with the authorities and responsibilities to adopt basin plans and then to periodically review, evaluate, and update them if necessary to protect beneficial uses over time. The 2014 California Water Action Plan identified updating the Bay Delta Water Quality Control Plan as a key action necessary for advancing the coequal goals in the Delta. The current plan really has not been substantially updated since 1995, and since then, the species and the ecosystem have continued to decline. The State Water Board is updating the Bay Delta Water Quality Control Plan in two phases. Phase 1 focuses on the San Joaquin River and salinity standards in the Southern Delta; phase 2 focuses on the Sacramento River and its tributaries, the east side tributaries to the Delta, and the larger Delta itself. Timing wise, Phase 1 is ahead of phase 2; a draft staff proposal has already been released and a Substitute Environmental Document has been prepared. A staff proposal or SED has not been released for Phase 2 yet. 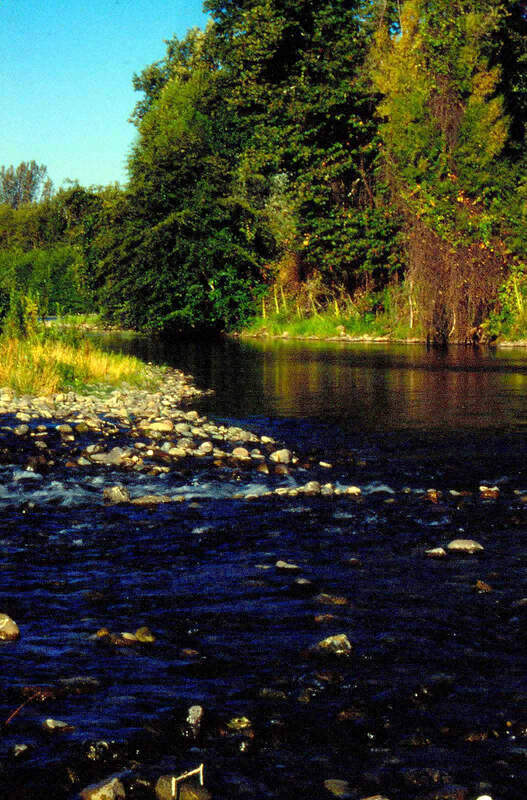 Phase 1 is proposing modified salinity requirements in the southern Delta for the protection of agriculture, and new flow objectives for the three major east-side tributaries to the San Joaquin: the Merced River, Tuolumne River, and Stanislaus River. Mr. Oppenheimer acknowledged that the current flow objectives for the San Joaquin River are set at a single location on the river at Vernalis, which is essentially the point where the San Joaquin River discharges into the Delta; those existing flow requirements are currently met through conditions on the water rights that the US Bureau of Reclamation operates under. Phase 2 is focused on the Sacramento River, its tributaries, and the larger Delta. There isn’t a staff proposal or an SED for Phase 2 yet; however, last fall a final scientific basis report and a fact sheet were released that included at a conceptual level the components of the update to the plan. “Those major components include inflows from the tributaries, new requirements for inflows to the tributaries, new requirements for Delta outflow, requirements for cold water habitat to protect storage in reservoirs that’s needed to maintain temperatures downstream of those reservoirs, and then updated interior Delta flow requirements that would govern operations of the water projects,” he said. Mr. Oppenheimer presented a slide (bottom, left) showing the relationship between the outmigration of juvenile salmon at Chipps Island plotted against flow at Rio Vista for April through June. “Basically what we see in these relationships is as flow goes up, outmigrating juvenile salmon abundance increases,” he said. Mr. Oppenheimer then explained how voluntary settlement agreements dovetail with the Board’s basin planning process. 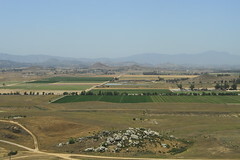 “From my perspective, it would be ideal if the settlement agreements were to come forward during the Board staff’s process of developing its proposal and it’s program of implementation for the basin plan, because if settlements come forward and our Board agreed that they were acceptable, we could incorporate them more cleanly into a program of implementation before we adopt it,” he said. If settlement agreements do come forward after the plan is adopted and they don’t fall within the range the Board adopted, the Board can still consider that, but it’s a more cumbersome process that will likely require the board to update the plan. “I also think that settlements that fall outside of an adopted range have a higher bar to cross in terms of demonstrating that these agreed upon actions will result in equivalent or hopefully greater benefits than the Board’s flow requirements alone,” he said. In terms of next steps, staff has been working for the last year on evaluating the comments received and preparing responses; the final staff report and responses to comments will be released sometime this summer. There were probably be a short comment period, the Board will consider adoption; they will either approve or not the staff proposal and certify the final substitute environmental document. For Phase 2, the plan is to release a staff proposal and the Supplemental Environmental Document also sometime this summer. And with that, Mr. Oppenheimer concluded his presentation. Tim O’Laughlin said he’s been dealing with the update to the Bay Delta Plan pretty much every day since the original draft report came out, and so today he would talk about the voluntary settlement processes and how they fit in with the water quality control plan and with California Water Fix. 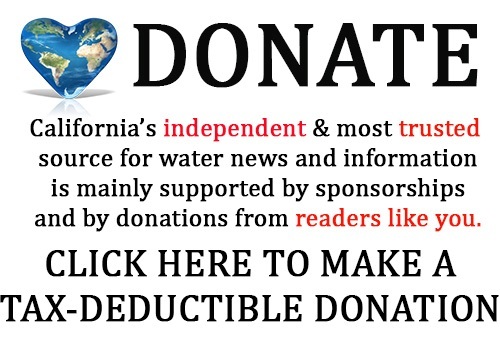 Unlike in 1995, California Water Fix is moving forward at the same time, Mr. O’Laughlin pointed out, and there’s a very significant phrase in the Delta Reform Act that says that if the Board is going to adopt permit conditions or approve the project and change the permits, that they have to decide what the appropriate Delta flow criteria are. Mr. O’Laughlin then discussed the voluntary settlement process, noting that he can’t give details as there is a confidentiality agreement, but he would give a sense of the disconnects that are happening. There’s a lot of talk about the natural production of anadromous fish, and that’s a laudable goal, but there’s a disconnect there as well, said Mr. O’Laughlin. The hatcheries are pumping out 32 million smolts a year, trucking them to the Delta or the ocean and releasing them, while in the San Joaquin River, the total production of fish spawning in the rivers and smolts going out is probably on average is about 300,000. US FWS prepares to release hatchery fish at Rio Vista, March 2015. Photo by USFWS. The charge of the State Water Board is to manage water for multiple beneficial uses in the Sacramento River basin. 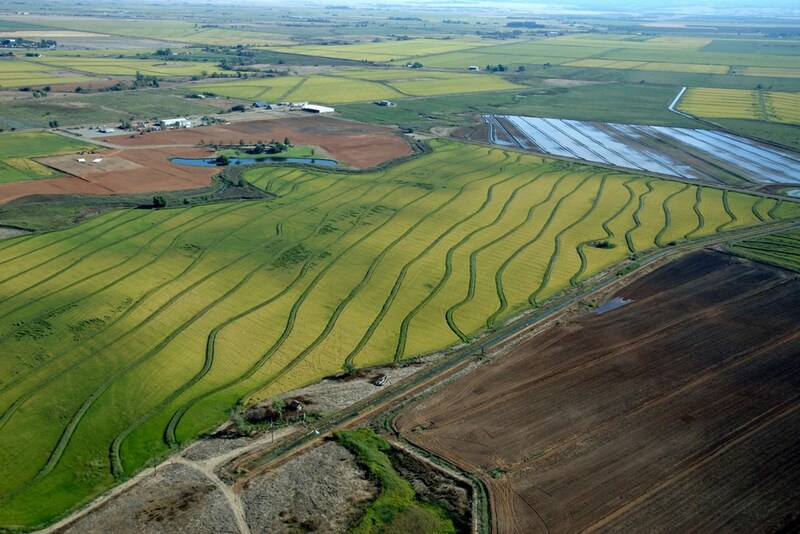 There are 2 million acres of farmland; four runs of salmon, two of which are endangered; the Pacific Flyway and the ricelands and the refuges, as well as the cities and rural communities that are sprinkled throughout the region. “What we try to figure out is how to manage water for all of those beneficial purposes, and obviously flows is a part of that discussion,” he said. 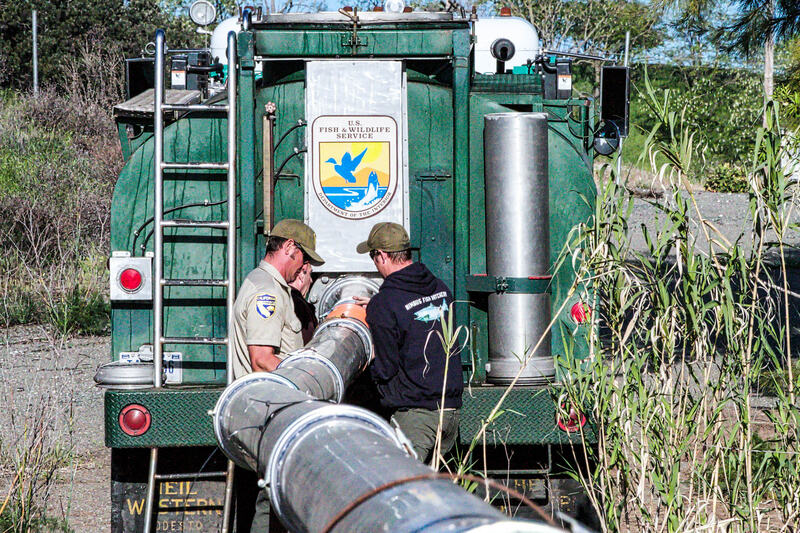 There has been a program underway for the last several decades to benefit fish and wildlife in the Sacramento River basin which has completed about 200 projects up and down the valley. The projects are all designed to benefit conditions for salmon and they all involve water with habitat, and the essence is how to integrate those into one place, he said. The Pacific Flyway is the environmental success story of our generation and it happened in large part because people figured out how to make this work for the Central Valley, so they have a great story they want to keep building on, he said. Butte Creek is a rather underwhelming place when you go there, but it has been incredible for spring run salmon, Mr. Guy said. Former Secretary of the Interior Bruce Babbitt and others recently came out to the banks of Butte Creek to celebrate 20 years of success. Butte Creek and the spring run have been really dynamic on Butte Creek and why is that? What does the science tell us? Mr. Guy noted that most of the science regarding unimpaired flows is about 20 to 30 years old. Look at the new science, he said; look at the science coming out of UC Davis, the Delta Stewardship Council and the Independent Science Board. It’s pretty exciting, he said. Mr. Guy then discussed four elements of the current scientific thinking that he thinks are important. 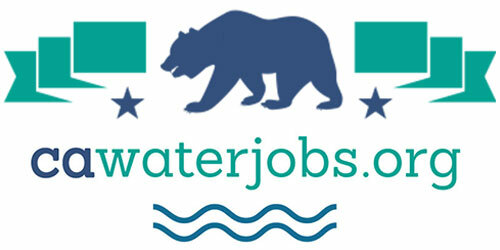 The State Water Contractors is an organization of 27 public water agencies that stretch from Yuba City down to the Mexican border and into the desert. “We have a very varied group of water representatives and water managers in our group, but one of the things I’m most proud of in this group is their commitment to science and to understanding exactly what is happening in the Delta, and managing water in a way that does provide benefits to the ecosystem and in a way that provides reliability in the way that the Delta is managed, and in that note, we are approaching the water quality control plan,” Ms. Pierre said. “So we’re really looking for a process that resets how we do science in the Delta, and how the governance and decision making occurs that is based on that science, and right now we have really no mechanism to incorporate into our decision making the information that we’re learning,” she said. Ms. Pierre pointed out that last year, Fall X2 was a reasonable and prudent alternative action that was included in the biological opinion; it was the second year that it was triggered since that biological opinion was issued in 2008. It cost the SWP 490,000 acre-feet of water, and yet the smelt surveys were showing that there actually weren’t any Delta smelt at all in the Delta during that period of time. Combined with the current water quality control plan and the biological opinions, on average 1.3 MAF of water is spent outflow annually and we’re not seeing any benefits from that, she said. She referenced the recent PPIC blogs, noting that they go back to the functional flow idea of how to use flow in a way to not only to just put more flow in the system but to target things like temperature in the tributaries, or working with the tides in a way that slows things down and provides food benefits as well as to minimize aquatic weeds. Moderator Brent Hastey who is Chairman of the Board of Directors of the Yuba County Water Agency recalled how they worked through a voluntary settlement that resulted in the Yuba Accord, and that took them a lot of Saturdays and about three and a half years. The State Water Board will be releasing documents this summer, which is a pretty short time frame. We have less than three months to finish this up. Is that possible? And if so, what are the strategies that you think can make that happen? 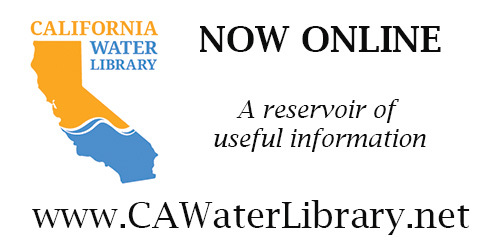 For more information on the Bay Delta Water Quality Control Plan, click here.